The beautiful village of Hawaii Kai is located on Oahu’s southeast shore, where visitors from all over the world come to enjoy its sandy beaches, tropical climate, and relaxing island lifestyle. As one of the largest communities on the eastern side of the island, Hawaii Kai is a residential region located within the city of Honolulu. Because of the Maunalua Bay, early construction was difficult, thus founders transformed the bay into a network of waterway channels surrounding homes, neighborhoods, and commercial properties. Since then, Hawaii Kai has become a beautiful community for those who love the closeness of nature, one-of-a-kind island flair, and abundance of recreation. The Hawaii Kai community serves its residents through fun recreation and convenient amenities while boasting of the surrounding beauty of numerous parks and natural landmarks. Encompassing Koko Head, Sandy Beach Park, and the Hanauma Bay, there are challenging hikes, snorkeling adventures, and breathtaking views just waiting to be discovered. Residents love the close proximity to grocery stores, tasty restaurants, and other local businesses in the Hawaii Kai Towne Center. With numerous schools, churches, and parks, Hawaii Kai is the perfect neighborhood that will accommodate all prospective home buyers’ needs. From snorkeling in the clear waters of the Hanauma Bay to summiting the volcanic crater known as Koko Head, the beauty and luxuries of Hawaii Kai are unforgettable. From beautiful single family homes and condominiums to luxurious estates, Hawaii Kai boasts unique real estate with which home buyers from across the island of Oahu will fall in love. There are numerous locations from which to choose, whether you are searching for a charming estate on the Kamehame Ridge, or a quaint beach cottage in Kalamala Valley, each region contains its own amenities and conveniences catered to the needs of local residents. 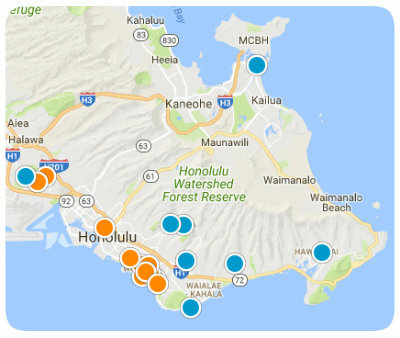 Homes in Hawaii Kai generally range from 1,000 to 5,000 square feet, and home buyers can easily choose the perfect home to fit their living preferences. If you would like more information regarding homes for sale near Hawaii Kai, Oahu, please allow us to assist you and contact us today. Peninsula At Hawaii Kai Ii Bldg. Lalea At Hawaii Kai 2 Bldg.